Now that our loved ones have come to another chapter of their lives, it is but just right to give them the best that we can. Their retirement years are products of the years, days, and hours they have sacrificed for our own. Their prime years are our chance to give it back to them. And when we want to ensure the best, there is one leading assisted living facility that accommodates their ever-changing requirements. 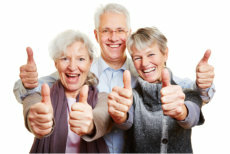 Choose Royal Palm Senior Residence for your parent or grandparent. Our assisted living facility is more than just a home – it’s a family caring for family. Royal Palm Senior Residence offers a place where elders enjoy the greatest aging experience of their lives: entertainment, relaxation, and safety. Our care programs are available through noon till noon the next morning, basically round the clock support ready to answer your needs. Choosing the assisted living home for our senior family member is as great a decision as preparing them for the next challenges they will face. In that, Royal Palm Senior Residence proposes that we face the challenge together. For whatever special condition your parent or grandparent is struggling with, we have assisted living services that can be customized to meet their requirements. Please address your questions to Royal Palm Senior Residence by calling us at 954-491-4041. We look forward to having you over!